The universal question: Chocolate or Vanilla? I am, and have always been, a chocolate girl. When I read a dessert menu, more often than not, my eyes will immediately zero in on the chocolate items. I love chocolate (now there’s an oft repeated statement) and will go to great lengths to get the chocolate I want. Chocolate for me draws pictures of things both sweet and sinful, dark never-ending passions, decadence, bliss. That being said, there are certain times when some rogue vanilla-craving sneaks up behind me, when things get a little to “noisy” and I seek solace in the simplicity of of the unadorned. Times when I yearn for something pure and white, like a crisp cotton shirt. When I long for sophistication instead of flamboyance, in a place where I lounge, cool as a cucumber, on Scandinavian furniture while sipping artesian water from Fiji. Yes, my escape to vanilla-land. Anyhoo, I rooted around the cookbooks and this is what I came up with. For the cake, I decided to make a pretty basic yellow cake from our battered, handed-down, copy of Betty Crocker’s Picture Cookbook. I had to adjust the recipe a bit as I didn’t have any shortening, so I used butter, which made for amazing flavor. For the icing, I used the icing for Nigella’s Burnt-Butter Brown Sugar Cupcakes, except I didn’t “burn” the butter, in order to keep the icing pure white. I also had to adjust the measurements because I didn’t have enough sugar on hand (so I apologize for the seemingly random and uneven quantities!). No tragedy…I still had icing leftover. – Sift together the flour, sugar, baking powder, and salt. – Add the butter, milk and vanilla, and beat for 2 minutes. – Add the eggs, and beat for another 2 minutes. – Pour into a greased and floured cake tin (I used a 9 inch one for this recipe. Although that wasn’t what it originally called for, it worked just fine. 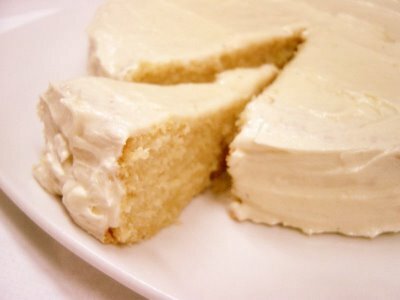 I also lined the bottom of the pan with parchment paper) and bake for 30 – 35 minutes (or until done, when the handy toothpick thrust into the center of the cake comes out clean). – Beat butter with around half the sugar, just to make it stiff. – Add milk and remaining sugar alternately until you reach a nice consistency. After the cake has cooled of completely, spread icing all over the cake to cover. It would have been nice if I had a straight edge spatula to clean up my white-out cake’s look…unfortunately we had to make do with the rustic, smear-y look.